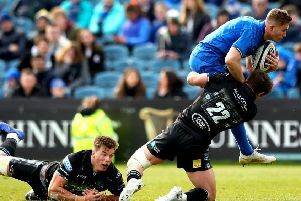 A brace of Cian Healy tries subjected Glasgow to another harsh lesson in European rugby as they lost 34-18 at home to Leinster. Glasgow’s European adventure is hanging by a thread after losing their second game in quick succession, this one in their own back yard. The visitors did their homework and took their lead from Exeter Chiefs who had rumbled right over the Warriors last weekend. Prop Cian Healy scored Leinster’s opening two tries from close range and while Glasgow scored two typically expansive tries of their own, Stuart Hogg in the first half, Tommy Seymour after the break, there were no additional points on offer for artistic merit. There was little consolation for Glasgow but plenty of injuries. Callum Gibbins tackled everything that moved but the Kiwi flanker ended the field bowed and bloodied from a great gash in his head. Glasgow lost their skipper Ryan Wilson to injury in the middle of the first half and Adam Ashe limped off late on, but Glasgow remain their own worst enemy with an error-strewn game. Sam Johnson made a brilliant solo break midway through the second half, ran 60 yards up field and then lost the ball in the tackle. of going through the attacking set and building pressure on the defence. One Irish journalist confided of Glasgow: “It’s like trying to get your kids to concentrate on their homework!” Leinster make mistakes but they never look like someone has set fire to their hair. The Irish province played the percentages and invariably took the right option rather than the most exciting; let’s see if Glasgow learn that lesson. When they weren’t throwing the ball away, Glasgow were getting bullied up front just as they had been in the opening 80 minutes of Champions Cup rugby. Leinster would milk a scrum or maul penalty, kick to the corner and Glasgow appeared powerless to halt their muscular driving play. Nowhere was this more apparent than immediately before half time. Leinster won a scrum penalty but Sexton aimed the eminently kickable penalty into the corner where he left his forwards 20 yards from the Glasgow line. It might as well have been 20 millimetres. The visiting forwards showed great control, keeping the maul narrow and the ball well shielded for Healy to claim his second of the half to give his side a 17-10 lead at the break that they never relinquished. Glasgow desperately need a driving game to call their own if only to add a little variety to their wide/wide plan. Midway through the second 40 Finn Russell aimed a kick into the corner, Glasgow won the lineout easily enough but were shunted 15 metres back before they could even get themselves set. Healy’s second try at the death if the first 40 was backed by Leinster’s third just four minutes into the second half that went a long way to deciding this match. Leinster scrum-half Luke McGrath sparked this one, bouncing off some half-hearted tackles, and Sexton finished it with one of his trademark wraparounds that saw the stand-off over the line untouched. Seymour got one try back just four minutes later as, with an early European exit looming large in their headlights, Glasgow finally found their rhythm and simply held on to the ball until a gap appeared on the right flank. The match stayed at 24-15 as it entered the final quarter and with his team playing catch up Dave Rennie might have looked to the bench a little earlier, throwing Scott Cummings, Alex Allan and Lee Jones into the fray on the one hour mark. Russell kicked a 64th minute penalty to drag his side to within six points of the visitors but only briefly. Just three minutes later Sexton replied in kind, after Peter Horne tackled the stand-off off the ball, and the Irish ten exited the arena with 13 minutes left to play, job done. And still there was time for Noel Reid to weave his way through a tiring Glasgow defence five minutes from time to add the bonus to the handy haul of points Leinster will take home with them.